SPN’s link to Searle, the Guardian documents show, was Stephen Moore, an editorial writer with the Wall Street Journal. Moore, who advises Searle on its grant-giving activities, was asked by SPN to rank the proposals in two halves – a “top 20” and “bottom 20”. It is not known how many of the 40 proposals were approved for funding, nor which may have been successful. Moore told the Guardian that he is an unpaid adviser to the Searle Foundation, having been a lifetime family friend to Dan Searle. He said the grant decisions were made by Searle’s sons and grandsons based upon the late businessman’s “commitment to the advancement of free enterprise and individual rights”. 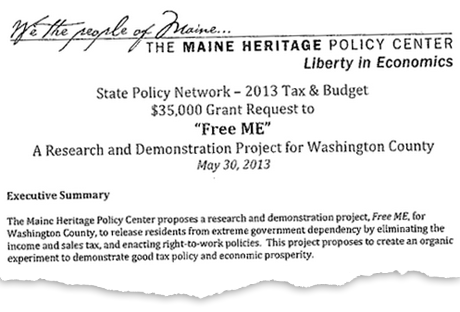 In its grant bid, the Maine Heritage Policy Center asked for $35,000 to support a “research and demonstration project” that would “release residents from extreme government dependency”. It would turn the state’s poorest area into what the Portland Press Herald describes in its report from Washington County as “a gigantic tax-free zone”. Dubbed “FreeME”, the initiative would eliminate state income tax and sale taxes from residents and businesses until the economic conditions in the county rise to the statewide average. The hole in the county’s income from lost tax revenues – estimated at $35m a year by the think tank – would be filled through budget cuts. “[S]topping Medicaid expansion is just the first step,” the proposal says, adding that the “missing piece to complete our message is an economic forecast” showing how block-granting Medicaid would “bring significant savings” to the state. That information would then be used to garner attention from the media. The Observer describes TPPF as “one of the most influential state-level thinktanks in the nation”. One of its former executives was Ted Cruz, now US senator for Texas, who today is the keynote speaker at the national conference in Washington of SPN’s sister organisation, the American Legislative Exchange Council (Alec). BHI appeared to have already arrived at its conclusions in advance, admitting from the outset that the aim of the research was to arm opponents of cap-and-trade with data for their arguments, and to weaken or destroy the initiative. “Success will take the form of media recognition, dissemination to stakeholders, and legislative activity that will pare back or repeal RGGI,” the funding proposal says. Watchdogs that monitor the work of SPN and other conservative networks in the US said that the centralised coordination of state-level campaigns showed a significant attempt to build local activism into a nationwide movement. Lisa Graves, executive director of the Center for Media and Democracy, which issued a recent report on SPN, said that the local identity of the network’s members belied a larger purpose. “They appear to be advocating purely local interests but what they are promoting is part of a larger national template to radically remake our government in a way that undermines public institutions and the rights of workers,” she said. Some of the grant bids to Searle focus specifically on prominent local politicians the thinktanks hope to influence. The grant bid that emanated from New Jersey, from the Common Sense Institute (CISNJ), another tax-exempt “research and education organization”, floats the idea of a campaign to support the efforts of the Republican governor Chris Christie in ending the ability of public employees to claim untaken sick days and vacation leave in their retirement packages. “Governor Chris Christie has been waging a war to eliminate this practice; and CSINJ would like to provide ammunition,” the proposal says. The thinktank plans to produce a “research study” which it would call “Busting the Boat Checks” – an allusion to the phrase Christie uses to denote the watercraft retirees are claimed to buy on the back of sick and holiday leave payments. The institute conceives a “media campaign” with its aim being the “full elimination of unused sick and vacation leave payouts”. “We believe our study can be used to sway public sentiment further and be used as a brandisher for reform in Trenton,” it says. CSINJ’s president, Jerry Cantrell, denied that the grant bid involved any element of lobbying, insisting instead that his group was providing a service that in the past might have been done by the decimated local media. “CSINJ is an education organization focused on providing the public with facts and the truth. We don’t represent any interest besides the folks who are burdened by this practice – the taxpayers,” he said. 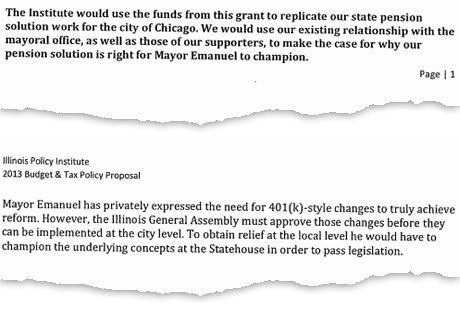 John Tillman, CEO of the Illinois Policy Institute, told the Guardian that Emanuel had been “an outspoken proponent of pension reform that includes moving to a 401(k)-style, defined contribution system.” He saw no problem with the lobbying that the think tank undertakes.